Everyone understands the meaning of the word “discount’’ but the word has a different connotation when it comes to brokers. Discount brokers, which are most often online and algorithm-generated, charge less for their services than full-service brokers do, but the lower cost carries with it the certainty of fewer services, and less personalized service. Discount brokers are, in essence, functionaries, making investments you want so you don’t have to go to the trouble yourself. Discount brokers are a part of a current wave of functions that can be done via algorithms and computer programs rather than by human beings. The outbreak of virtual or robo-advisors are part of the discount broker trend, as humans get replaced entirely with some programs because investors do not wish to pay advisors for advice. The challenge for living, breathing advisors is to get the message to investors using discount brokers that there is a wide-ranging selection of products and services that exist that they are not seeing and that are not available to them through discount or online brokers. The key is getting the message to them. An investor who is satisfied with their discount broker is not likely to be shopping for a more expensive broker, no matter how much growth that investor would likely see in his portfolio by expanding his investment choices and involving a professional who could expand the investor’s horizons. In an attempt to attract the investors who use discount or online brokers, advisors can offer services that are directed toward a single function, such as tax advice or retirement planning. That could get the advisor in the door and could lead to more involvement with the investor. The good news for advisors is that many investors using online brokers are likely to be on the lookout for something better. Spectrem’s new research regarding the advisors investors use, Profiling of Investors Based on Their Preferred Advisor Types, reveals that investors using discount brokers are the least satisfied investors, with only 50 percent claiming overall satisfaction and only 52 percent approving of their advisor’s knowledge and expertise. 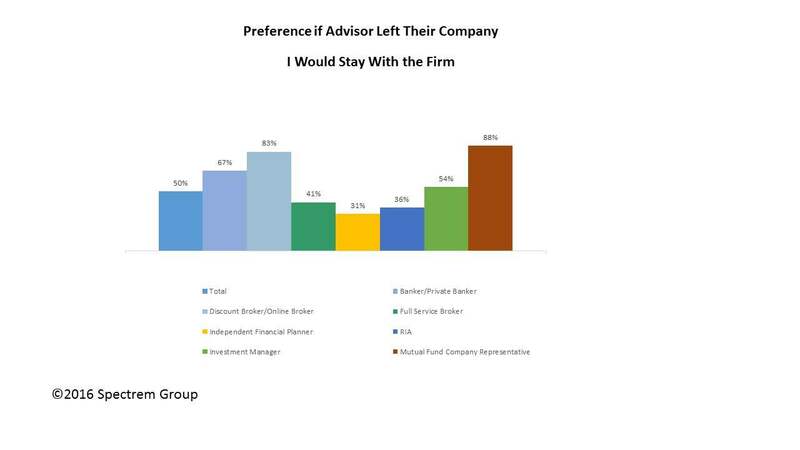 The report indicates investors using discount brokers have the lowest level of trust in their advisor as well. Advertising for investors currently using discount brokers is different than trying to attract investors who use a more full service advisor. Investors using discount brokers must be shown the value of employing an advisor who can fit an investment plan into an investor’s financial goals and that the additional advice can be beneficial beyond the cost of the service provided. Throwing the wide array of products and services you offer at an investor who uses a discount broker might not work. Investors using an online service are probably not looking for a huge expansion of their investment opportunities; otherwise, they would already have moved away from the online broker. Perhaps appealing to the investor’s need for a more responsive advisor (online brokers are notoriously unresponsive, especially when there is no human element involved) would be a wise strategy. Interestingly, investors using online brokers consider themselves to be fairly knowledgeable about investment products and services, and are also more likely to be willing to risk a significant portion of their investments at risk. The Spectrem report shows that investors using discount brokers have the highest percentage of very knowledgeable investors and the most aggressive ones. Explaining how your firm’s investment strategies take advantage of both an investor’s knowledge and aggressiveness could be a selling point to attract an investor away from the online service. Investors use discount brokers and robo-advisors for a reason. Cost is one of them. Another is the belief that those types of advisors can handle their investment needs. Advisors must differentiate themselves from the discount brokers by providing a simplified list of services they provide, and how those services can be cost-effective. Many investors using discount brokers consider themselves knowledgeable about investing and investment products, and believe they can handle their investments through the use of the simplified discount broker process. Advisors must show that their skill and knowledge can benefit even the most intelligent, well-prepared investor, without making the investor feel they are not being discredited.